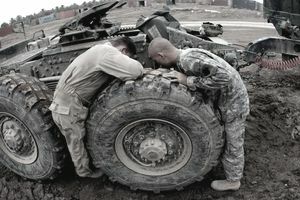 Army Wheeled Vehicle Mechanics are responsible, as the title suggests, for handling maintenance and repair of all tactical and some armored vehicles, both heavy and light. If the Army's trucks and other vehicles aren't working properly, at best it means lost time, at worst, it could mean soldiers are in jeopardy. So while it's a grease monkey job, the wheeled vehicle mechanic is just as important to Army operations as any other soldier. This job is categorized as Army military occupational specialty (MOS) 91B. Wheeled vehicles make up the majority of the Army's fleet; think Jeeps and trucks rather than tanks. These soldiers are responsible for making sure all wheeled vehicles are up to speed with repairs and maintenance. The detailed list includes inspecting, servicing, repairing and replacing, adjusting and testing their systems, subsystems and all components. MOS 91B oversees the vehicles' electrical systems, which includes wiring harness, starting and charging systems. They're also tasked with performing wheeled vehicle recovery operations, such as when a vehicle becomes disabled during on en route to a mission or other assignment. Wheeled vehicle mechanics receive ten weeks of Basic Combat Training and 13 weeks of Advanced Individual Training (AIT), which includes classroom and on-the-job instruction. If you have interest in auto mechanics, can troubleshoot and fix mechanical problems and have interest in engines, this Army job will be rewarding for you (and you'll be ahead of the game on day one). Even if you don't have pre-existing mechanic skills, if you are interested in the work and can handle the physical requirements of the job, wheeled vehicle mechanic is a job with potential to have an impact on the success of the Army's overall mission. It's hard for the Army to get anywhere without its wheeled vehicles after all. To be eligible to serve as a wheeled vehicle mechanic, there are two possible scenarios for meeting the testing requirements. You can either score a 92 on the mechanical maintenance (MM) segment of the Armed Services Vocational Aptitude Battery (ASVAB) tests or an 87 in MM and an 85 in the general technical (GT) portion of the test. There is no Department of Defense security clearance needed to serve as an Army wheeled vehicle mechanic. You'll need to have normal color vision, so colorblindness is a potentially disqualifying factor. You'll be ready for a career in a wide assortment of mechanic positions, including working for a garage, as a transmission mechanic or a radiator mechanic. You can work as an automotive service technician and mechanic for a variety of employers including auto dealerships. Since you'll learn leadership skills in the Army as well, you'll be prepared to supervise mechanics, installers, and repairers. And if you are entrepreneurial, you may even be able to open your own garage eventually.